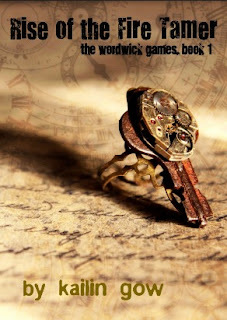 The first book of The Wordwick Games is full of high adventure and SAT worthy words. Kailin Gow's probably most complex story takes readers to a world that goes from modern to fantastically medieval. Beware the dragons and ogres and evil wizards! Henry Word's famous Wordwick Game has a secretive Level 10 and only Gem, Sparks, Jack, Kat and Rio will be privy to the dangers and learning experiences that Anachronia poses. While only one can become the helpful ruler of Anachronia, the group will have to work together to bring peace to two warring tribes and see the game through to the end. 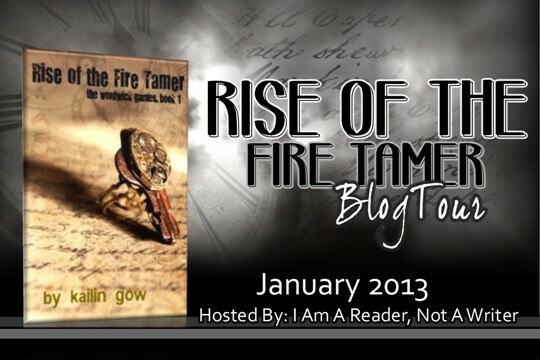 Rise of the Fire Tamer brings forth all that one would expect in one of Kailin's fantasy novels. The challenges, the magic, and the unique base for the story's plot. What makes this story different and more complex is the fact that the story's main plot tells Gem's story, but follows multiple characters. Gem isn't even the first character readers will meet. Fortunately, Kailin keeps it all straight and makes introducing this big group of characters fun and entertaining. Though Kat was actually my favorite character, the underestimated, weird and outspoken rebel that she was really stuck out for me, I did appreciate how steady Gem was. I wasn't too crazy that all the guys in the story were just infatuated with her because of her beauty while thinking that she was just a dumb cheerleader, but her ability to think in stressful situations was awesome. The Wordwick Games seems like it will fall in the same category as Kailin's Alchemists Academy series. The dramatic endings will prove that whatever is next in the series will be tremendously surprising and unexpected. It's with these stories that Kailin really draws focus to the character's unknown pasts and great futures. Even with Rise of the Fire Tamer's revealing ending, I couldn't possibly say that I have any inkling of where this series is headed. Virtual gaming is a first for me, but Kailin's work surely isn't! I have every bit of faith that the next book, The Ascension, will hit all of Kailin's previous marks and go even further. Open only to those who can legally enter, receive and use an Amazon.com Gift Code or Paypal Cash. Winning Entry will be verified prior to prize being awarded. No purchase necessary. You must be 18 or older to enter or have your parent enter for you. The winner will be chosen by rafflecopter and announced here as well as emailed and will have 48 hours to respond or a new winner will be chosen. This giveaway is in no way associated with Facebook, Twitter, Rafflecopter or any other entity unless otherwise specified. The number of eligible entries received determines the odds of winning. Giveaway was organized by Kathy from I Am A Reader, Not A Writer http:// iamareader.com and sponsored by the author. VOID WHERE PROHIBITED BY LAW. Catch up with Timeless by Alexandra Monir! JAN 2013: Kindle Fire HD Giveaway!